An examination of our system of imprisonment, critiquing the causes of and myths surrounding mass incarceration, as well as a path to reform. ...[an] extremely important book ... Mr. Pfaff also makes a compelling case that incarceration disrupts the lives of the incarcerated and their families long after they have served their time. Only half of those released are able to find employment within a year of getting out ... Once prosecutors decide to prosecute a case, Mr. Pfaff shows, they convince defendants to plead guilty 95% of the time. Letting prosecutors threaten long sentences and plea-bargain down means that pretty much nobody has his day in court. ...the book demands much more than tinkering at the edges with the current model of incarceration. It advocates for a cultural shift among prosecutors and the public, to view prisoners not only as criminals, but also as people who have impulsively and regrettably committed crimes. As people who should be helped rather than merely warehoused and incapacitated. It reads more as a clarion call toward what might one day be than a set of policy formulations that could be easily enacted ... Pfaff admits that he is doubtful leaders will embrace the argument in the short run. It is less politically risky for people to be kept in prison for too long than released too early — or not sent to prison in the first place. But whether the zeitgeist on this issue shifts or not, to those asking why the United States imprisons so many of its people, the answers and hints of possible reform are here. Pfaff, let there be no doubt, is a reformer ... But he also makes a more complicated argument, following recent sociological research: it’s not that the prohibition of drugs attracts crime, which then produces violence; it’s that violence thrives among young men deprived of a faith in their own upward mobility, making drug dealing an attractive business ... Putting aside quarrels about the specific numbers, one can accept the broad truth of Pfaff’s data without necessarily buying into his position completely. 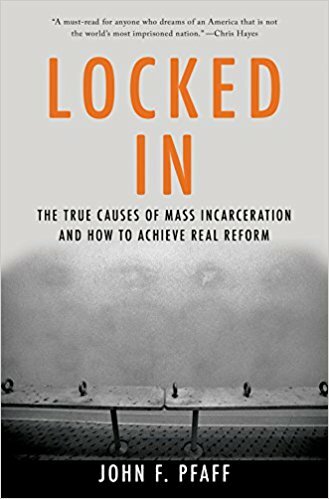 What did you think of Locked In: The True Causes of Mass Incarceration—and How to Achieve Real Reform?